ElliptiGO athlete Brian Reynolds has been selected to compete in the 2018 World Para Athletics Marathon World Cup at the London Marathon. ElliptiGO, along with 300 other guests, celebrated Meb Keflezighi’s New York City Marathon race and retirement at a surprise party on November 13th in San Diego. ElliptiGO was out in full force at the New York City Marathon weekend, with top athletes represented in both the marathon and USATF 5k Championships and members of the Global Elliptical Riders Club (GERC) taking to the City streets to show off their GOs and get some miles in while spectating at the Marathon. A stable of ElliptiGO athletes will be toeing the starting line of the TCS New York City Marathon and USATF 5k Championships on November 4th and 5th, 2017. We at ElliptiGO look forward to Meb Keflezighi's final marathon with excitement and joy. Brian Reynolds set the official double below-the-knee amputee world record in the Chicago Marathon on October 8, 2017, where he ran 3:06:31. ElliptiGO and World Class Track & Field training program Altis World have partnered to create a recipe for success. 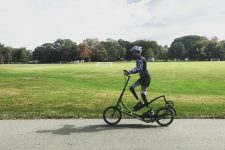 Heading into the 2017 school year, ElliptiGO launched its School Giveaway Contest in August, inviting high school and college coaches across the country from all sports to submit an application saying how their program would use the product and why they were deserving of this complete training package, valued at $3,000. ElliptiGO elite track and field athletes were stars at the USA Track and Field Championships, and many earned berths to the World Champs. In the 40th running of the TCS New York City Marathon, three ElliptiGO athletes finished in the top 10 and six placed in the top 20, cheered on by Rio Olympians and fellow ElliptiGO athletes Meb Keflezighi and Jared Ward, who were co-Grand Marshalls of the race.